RasterEdge provides flexible and affordable barcode generating solution for integrating Code 11 barcode images into C#.NET project. This C#.NET Imaging Barcode Creator SDK can generate & save Code 11 barcode to gif, png, jpeg, and bmp image files using Visual C# coding in Microsoft Visual Studio 2005 and above. In addition, PDF, TIFF, MS Office Word, Excel and PowerPoint files are supported for Code 11 implementation as well. You can easily generator Code11 barcode and save it to image files/object using this C#.NET barcode generator control. The following steps will show how to create a Code11 type barcode encoding numeric data text "112233445566" into the image object with XImage.Barcode.Creator. Please copy the sample code as follow to generator a Code11 barcode. RasterEdge allows Visual C#.NET developers to created Code 11 on popular image files, including BMP, GIF, JPEG, and PNG. Besides, users can print the Code 11 bar code on the image within any area, by simply defining the x and y coordinates to embed on image. 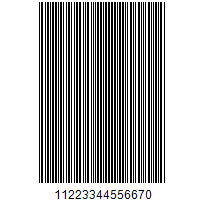 Below is the Visual C# sample codes for printing Code 11 barcode on png image, encoding numeric data "0123456789-" with a default resolution of 96 DPI. Developers can create Code 11 on certain PDF, TIFF, Word, Excel or PowerPoint document page with RasterEdge powerful .NET barcode generator SDK. All you need to do is simply copy the following C# demo code to your program for a test. You can make necessary modification for the barcode location on image, and adjust the Code 11 bar code dimensions as well. This is the Visual C# sample code to adjust the Code 11 bar code properties listed above. Use it in your .NET application to create Code 11 barcode on BMP, JPEG, PNG, GIF images and PDF, TIFF, Word, Excel, PowerPoint documents.